At Missouri Baptist University students can earn their RN to BSN degree online in as few as 12 months. The Online RN to BSN program at Missouri Baptist University is a degree completion program for qualified registered nurses (RNs) who have completed their associate’s degree in nursing. This unique curriculum prepares students spiritually, intellectually, and professionally for a lifelong career in nursing. Real-world Experience – MBU’s RN to BSN professors have real-world, professional experience to help students get up to date on all current challenges and trends in the field. Academics and Faith – MBU is a Christian University in St. Louis, committed to providing strong academic programs with a focus on integrating personal faith in the practice of nursing while serving a global and culturally diverse community. Investing in Advancement – MBU’s RN to BSN students are actively making the decision to invest in their nursing education and to improve their employability in the nursing field as more healthcare organizations are strictly employing those who have completed their BSN degree. Real Value – Designed with the flexibility and convenience that working nurses need, the MBU RN to BSN degree is also affordable. 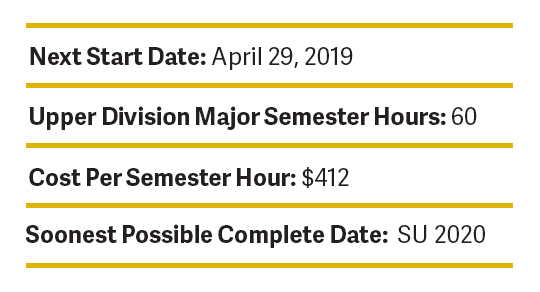 With a total cost of $412 per credit hour, the pathway to career advancement is within reach. 100% Online – Flexible online classes that work with your shift schedule and busy lifestyle. Advance your career while working full-time – This program is designed to accommodate the working RN. Full-time students can complete their degree in as few as 12 months or can choose to be part-time and complete the program in as few as 22 months. Transfer-friendly – RN to BSN students may be eligible to receive up to 90 credit hours in transfer credit for proficiency validated by their RN licensure. The prestige of a Missouri Baptist University Degree – Your MBU degree comes with the legacy of academic excellence. The online RN to BSN degree program at MBU prepares students for a broad scope of practice. Graduates will be ready for increased responsibility, career advancement, and a rewarding future in a fast-paced work environment. Admission requirements include a completed, state board-approved associate degree or diploma from a nursing program, a current, unrestricted RN license (or completion by the end of the second term), and a minimum 2.0 cumulative GPA. Students must complete the general education courses as listed on the degree sheet for graduation from the RN-BSN program. Students do not need to have all courses completed prior to applying to the program, but courses must be completed prior to graduation. RN-BSN learners may receive up to 40 credit hours of nursing credit for proficiency validated by RN licensure. This allows 40 credit hours from the associate degree program to be validated as meeting the outcomes equivalent to those achieved in baccalaureate-degree-granting institutions. 4. Minimum 2.0 cumulative GPA for all college course work. 1. Complete all general education courses with an overall GPA of 2.0. 2. Complete a minimum of 120 credit hours. The RN-BSN program can be completed in as little as 12 months for full-time students and 22 months for part-time students. Request More Information About This Program Today!